While I’m accustomed to canning for long-term storage, I realize not everyone is. Water bathing and pressure canning can seem overwhelming and time consuming. Fridge pickles are the answer! 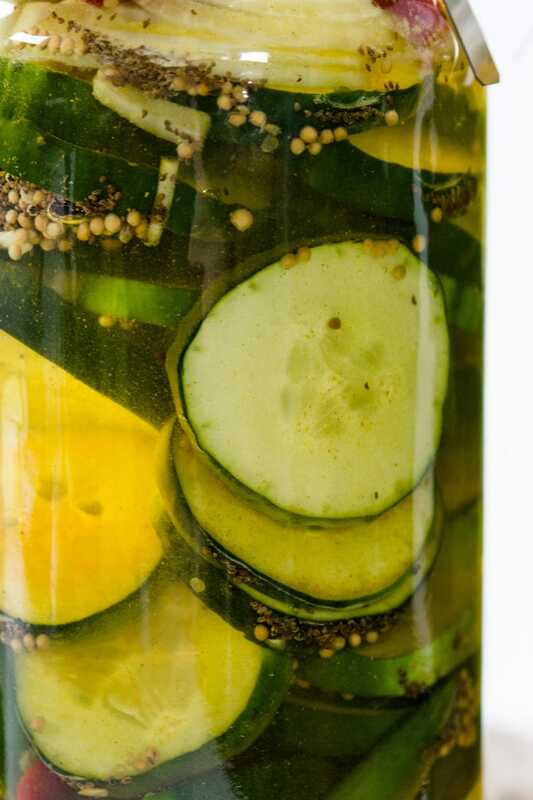 You can throw together a brine, cut some onion and cucumbers and you have pickles! 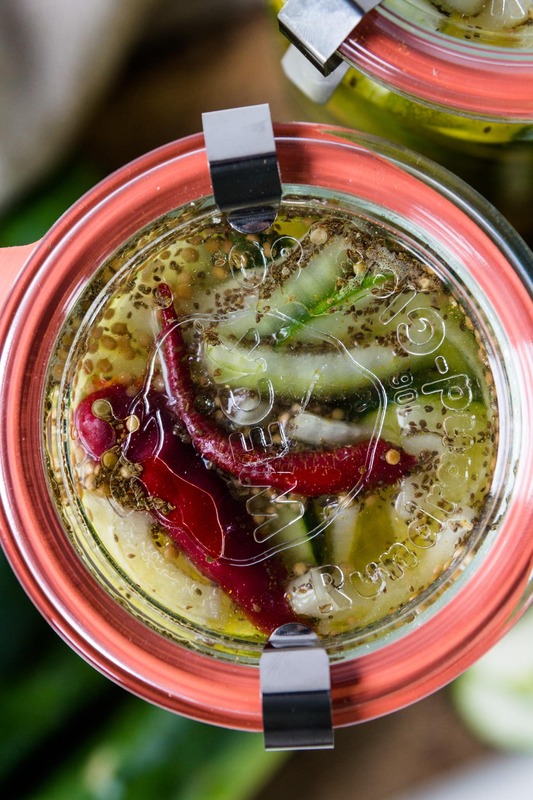 Just store in the fridge (I love to use these handy Weck jars) and you’ll have crunchy, amazing pickles to enjoy. 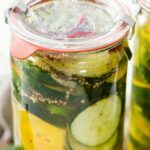 This is a great way to start preserving if you are new to the idea or, like me, if you just love anything pickled! These keep for up to three months. Enjoy on a hamburger or straight from the jar. I’ll let you in on a secret – straight from the jar is usually my preferred way of eating these! Any way you consume them, they’re delicious! Have any questions about canning (’cause you can totally can this recipe too)? Check out my canning 101 video that gives some basics on the process and the supplies you’ll need. When you make the recipe, make sure to leave me a comment and leave a rating on the recipe. I’d love to hear how the recipe worked for you! 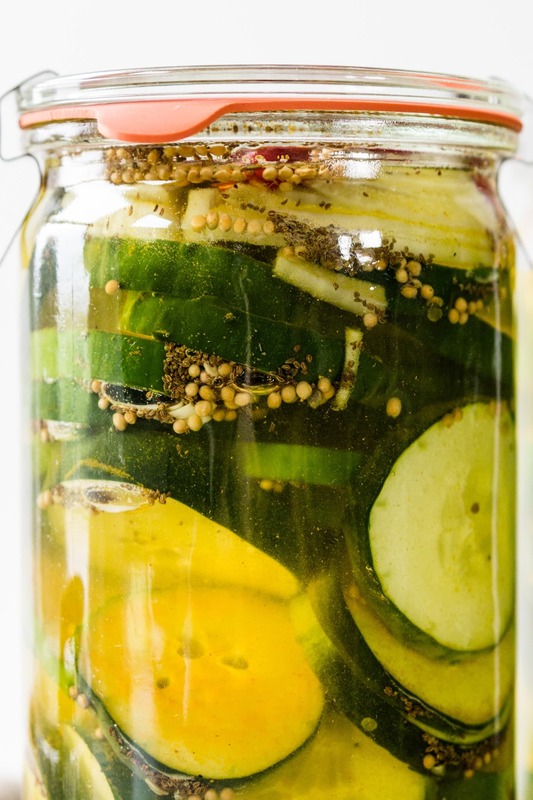 These fridge pickles made from cucumbers, onions and red peppers in a vinegar liquid are a great way to enjoy the bounty of the season! And it’s fridge stable – no need to can! Have ready two quart jars, washed and sterilized. To make the brine, combine the sugar, vinegar and salt and whisk until the sugar and salt are completely dissolved. Add turmeric, celery and mustard seed. Stir and set aside. 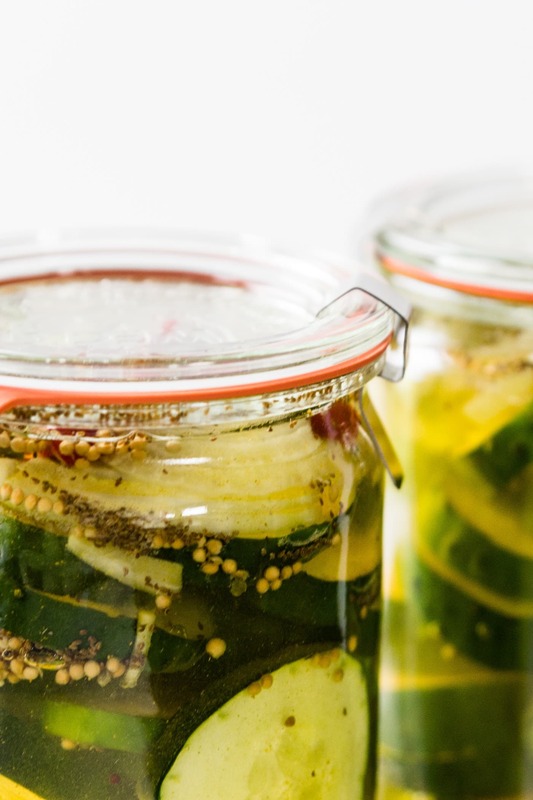 Slice some onion and place in bottom of prepared quart jars with hot pepper (if using) and top with cucumber chips. Once filled, top with a little more onion or peppers. Pour prepared brine into the jars until it covers all the cucumbers and onions. It is important that all ingredients are submerged in the brine as this is what preserves them! Place on airtight lids and transfer to the refrigerator. I think it’s best to let these pickles sit for 10 days before eating. The longer they sit in the brine, the more flavorful they’ll become. As they sit, the cucumbers shrink and this is completely normal. You may add more slices to the jar if you like. 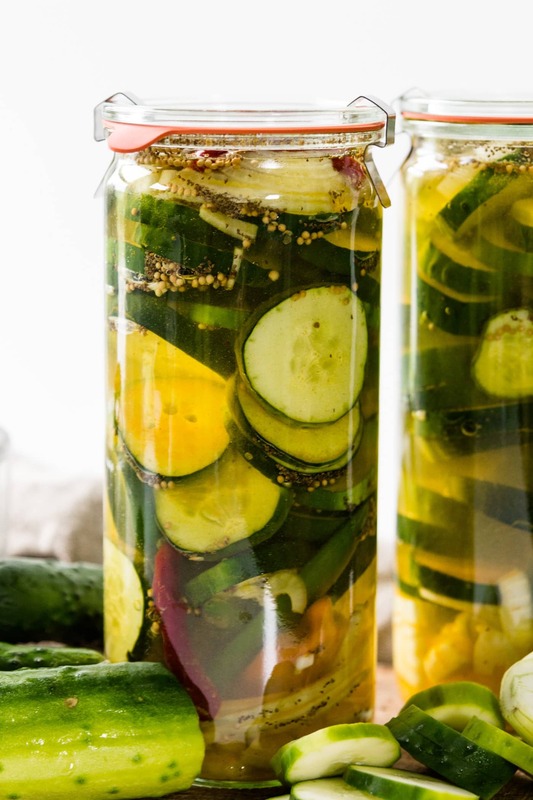 Would these taste like “bread and butter” pickles? Those always were my favorite kind, even though I never was sure how they got that name.